On this album, Frank Farian abandoned the lush sounds and adventurous arrangements that had characterized past Boney M albums to make a straightforward album of electronic dance-pop. Sadly, this decision works against the album because it robs the group's sound of much of its personality. For example, "Todos Buenos" cries out for a lush Latin arrangement but is forced to settle for a monotonous synthesizer-heavy sound that is tarted up with a few flamenco guitar flourishes. Another problem is inconsistent songwriting. For instance, "Give It Up" is the kind of lame, faceless breakup song that could have been performed by any dance-pop group. 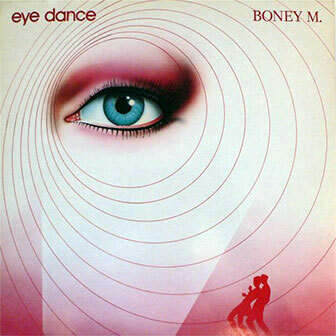 Eye Dance is further weighed down by a dreadful pair of covers: "My Cherie Amour" is a given a lightweight, easy listening treatment that fails to reach the yearning romanticism of the Stevie Wonder original, and the group's cover of 10cc's "Dreadlock Holiday" misses out on both the reggae flavor and the ironic humor of the original version. However, a few bright spots manage to shine through on the album: "Chica Da Silva" is a compelling story song about a beautiful female spy who becomes a martyred heroine to her country, and "Bang Bang Lulu" is a bubblegum-styled singalong tune in the vein of "Brown Girl in the Ring." Despite these likable moments, Eye Dance never is able to triumph over its threadbare sound and is further hurt by its inconsistent songwriting. Even the most enthusiastic Boney M fans may want to think twice before picking this album up. — Donald A. Guarisco. Y-O-U-N-G F-R- double E, a-a-and single, sss-single.